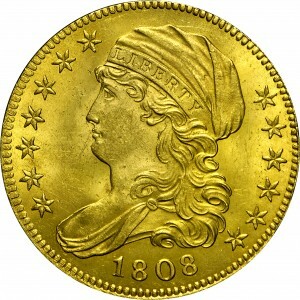 Although Walter Breen described three different varieties for the 1808 half eagles with a normal date, just two are included in this display of coins from the Bass Collection. Harry Bass believed that the third variety described by Breen as his variety 3-A is from the same obverse die as this example, identified as Breen 4-A, and thus is of the same variety. The description by Walter Breen was from an older auction catalogue with poor quality plates. 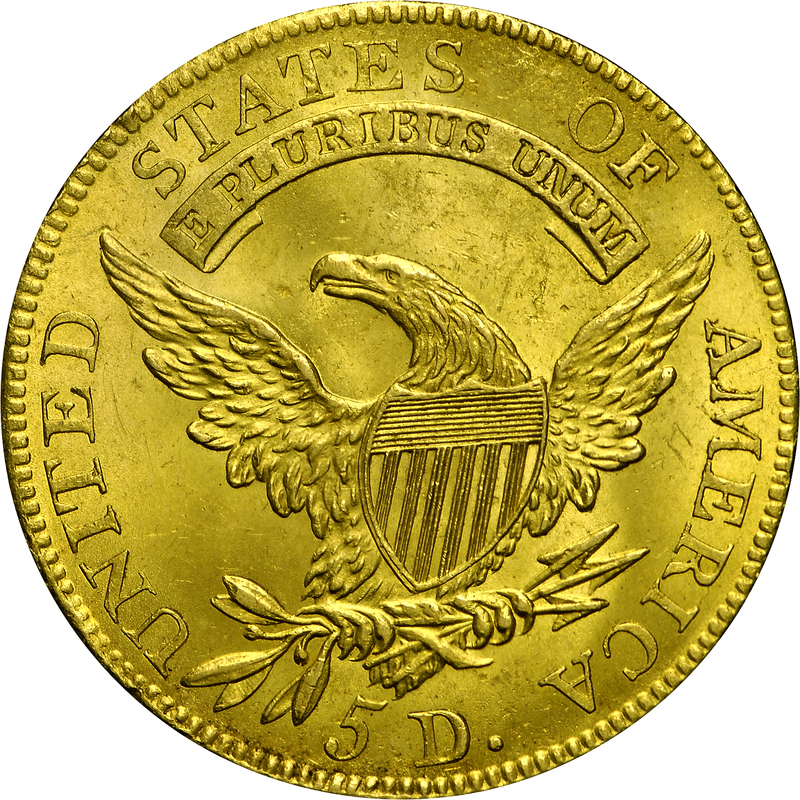 The reverse of this variety has I in PLURIBUS centered beneath the space between TE in STATES. From Superior's sale of the Dr. Charles Ruby Collection, Part III, February 1975, Lot 1150. 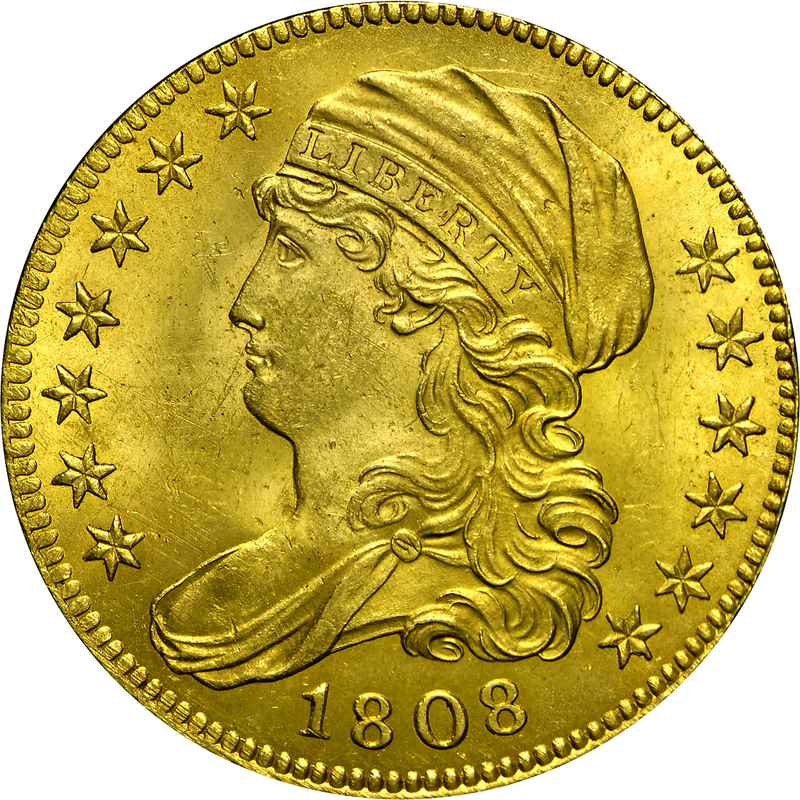 "Obverse: Normal 8. Close date, arced; spaced 1 8 08; distanced from long denticles. Top of 1 higher than that of 8. Miniscule die center punch lump. Upright of 1 centered over a space between denticles. 0 centered over a denticle. (HWB believes Breen obverses 3 and 4 to be the same die). 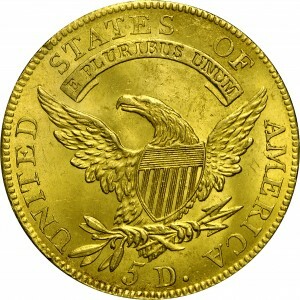 Reverse: That of 1807Y (b), 5D close. D apart from wing. U near leaf. 5 near leaf. Lapping has removed all trace of prior clash within shield."